Eox's Blackmoon region contains countless forgotten Eoxian ruins, leftovers from an apocalyptic assault on the planet. Few are allowed to dig up these sites, yet the Starfinder Society and undead bone sages maintain a joint academic venture known as the Blackmoon Excavation. When Starfinder archaeologists and undead workers begin disappearing from the site the Society sends in a team of agents to uncover why—a secret that resides in the nearby ruins! This scenario takes place on Eox, a planet with a thin and toxic atmosphere that is run and populated by undead. More specifically it stops in the city of Zinhew, before heading out to the Blackmoon excavation site, and into the barren wastes of the planet. GMs will need to familiarize themselves with the poison rules, while players will need to ensure they have armour, which can protect them from many of the environmental hazards of Eox. The scenario makes excellent use of Pact Worlds history and current politics, which I thought was wonderful. Not only does it involve the history of Eox, but it also touches on the history of the Diaspora, Damiar, Iovo, as well as the Magefire Rebellion of 7AG, and the Thousand Moons trap. Although learning this history and background information isn’t necessary, knowledgable PCs will get extra enjoyment from doing so. It’s a great scenario to crack out your know-it-alls! The mystery and investigation itself has multiple avenues of inquiry, and accounts for a wide array of skills that can be used to gain information. Players who find themselves stumped need not worry, as the scenario keeps moving even if you’re stuck. That said, uncovering as much as you can has benefits, so good investigation is rewarded. It provides some unique roleplaying encounters, mechanically interesting battles, and environmental hazards. One of these battles could be particularly challenging for some groups, but I rather enjoyed it. This scenario also strongly gives the PCs agency. 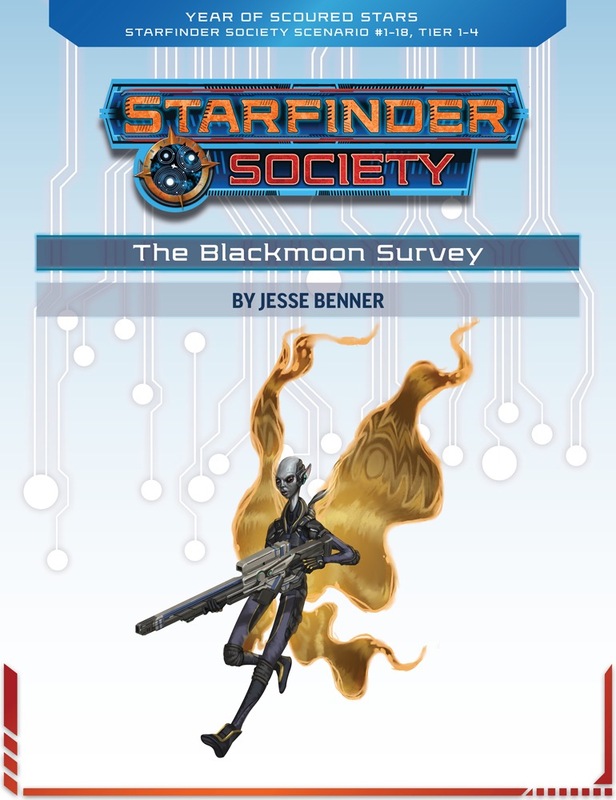 There are multiple resolutions to this adventure, and your actions have a direct impact on which boons you receive and how various groups perceive you and the Starfinder Society as a whole. I played through The Blackmoon Survey with my infamous self-medicating Solarian, and I didn't have high expectations going in. I'm not sure exactly why, but the description of the scenario made it sound kind of bland and generic. I was pleasantly surprised, however, and really had a blast. There's a solid mystery (complete with red herrings), a very original encounter, and fantastic integration of world lore. With its excellent mix of combat, investigation, and role-playing (plus a good setting), this one has it all. The scenario begins with the usual mission briefing from Venture-Captain Arvin. He explains that the Starfinder Society has begun an excavation on a geological anomaly on the planet Eox (a planet of undead!). The anomaly is called Blackmoon, and it is the surprisingly-intact portion of a moon that crashed into Eox when its ruling bone sages inadvertently triggered an ancient doomsday weapon left in orbit by a race of creatures called sarcesians that live in a nearby asteroid field called the Diaspora. The problem is that several members of the excavation team have gone missing, so the PCs are dispatched to investigate and put things right. It's a classic set-up, but the setting makes it work: this is the first SFS scenario to take place on Eox, one of the most memorable planets in the Pact Worlds, and the use of Blackmoon is a great location drawn from the recent hardcover book that talks about the planets in the system. When the PCs arrive on Eox, they're ferried from the spaceport to the dig site by an imposing Vesk named Berchta Deepdelver. Waiting for them at the dig site is the excavation's overseeer, a kasatha named Taylehm. Taylehm is a boroi (a sort of partially-undead living creature that still has its soul), and she gives the PCs more information about what's been going on: the disappearances started at a particular dig site removed from the main excavation, some bodies have turned up, and several pieces of excavation equipment have been wrecked. At this point, the PCs have several options for investigation, such as examining the bodies, questioning the archaeologists, looking at the site where the disappearances occurred, etc. Some clues point to perhaps feral undead being involved, while others hint that the whole thing may be an inside job. I won't go into detail on the clues, but on the whole I was satisfied with their variety and ultimate consistency. Apart from a hazard called a Glass Cyclone, the first dangerous encounter the PCs will stumble into is when they try to find a security force that Taylehm dispatched earlier. The encounter is a controversial one in the forums, but I love it. The set-up is that the PCs enter one end of a narrow canyon and, on a rise at the other end of the canyon, nearly a *1,000* feet away, a team of snipers open fire on the PCs! The map has a scale of thirty feet per square, and the encounter is designed to give sniper weapons a chance to shine (something long requested) and make range increments meaningful. I thought it was a great change of pace from the standard encounter where everyone starts within charge range of one another, and even though my melee-only PC got blasted several times, I had a lot of fun with it. Running the encounter required a little abstraction by our GM (30' squares don't always play nicely when someone moves 20', for example), but on the whole I think it was worthwhile and I'd like to see more encounters that put Starfinder's emphasis on ranged combat to good effect. The snipers turn out to be sarcesians (the cover is an unfortunate spoiler), and a datapad allows them to be traced back to a hidden, abandoned outpost of a group called the Wings of Damiar. The Wings of Damiar are a sect of sarcesians who have been monitoring the bone sages of Eox for signs of treachery against the Pact Worlds, but recently there was a schism and an off-shoot of the group decided to take a more violent approach. It's this off-shoot that was responsible for the disappearances and sabotage of the SFS excavation team, as they were seen as willing accomplices to the bone sages' attempts to uncover the secrets of Blackmoon. The PCs will be able to track the dangerous sarcesians down and confront them. The battle isn't particularly memorable, but it's solid. However, the scenario doesn't end there, as the PCs have to make an interesting moral decision: should they reveal to the Eoxians that the sarcesians have been watching them (and thus gain favour with the dominant species on the planet), or should they keep the existence of the sarcesians secret (and risk damage to the Society's reputation if the bone sages discover them later)? The choice isn't an easy or obvious one, and it's quite significant for the boon the players earn: either the right to play a sarcesian in the future or, if their PC ever dies, to have them come back as a boroi! Very cool. 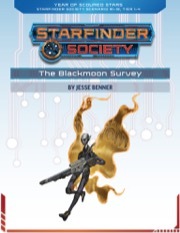 I really enjoyed the writing on The Blackmoon Survey, and I feel like I understand the dicey relationship between the sarcesians and bone sages much better. One of the best things about SFS scenarios is how they allow a player to experience so many different places in the campaign setting, and this is exemplified here. The investigation aspect was solid, and the long-range encounter was refreshing. All in all, I'd play this one again--if I could! Not bad, but sadly kind of forgettable. An interesting scenario. It does nothing wrong-per se. The session revolves around a mystery at an archaeological dig that is in the sovereign territory of Eox. Theoretically this could have been a lot of fun by navigating political waters while solving a mystery. But it just isn’t engaging. There are basically three suspect groups for the mystery, but you either make the knowledge checks and essentially know who it is from the beginning during the mission briefing, or you don’t make the knowledge checks and the reveal comes out of left field. A few more sprinkling of clues as to the real perpetrators, and possibly a few more red herrings, could have really spiced up this scenario. As it is, the scenario is certainly not . . . Bad. There are no major issues (well, there is, a party of melee beat-sticks will have trouble here) but it is sadly just kind of. . . forgettable. When stacked up against the flavor of other recent scenarios, like Save the Rendrokas, Live Exploration Extreme, or Star Sugar Heart Love, it doesn’t even compare. What time? I would like to know. Is it a online game? If so I will play with my vesk character. Does it cost to play? This is just the product page that tells people about the scenario in general. Are you looking to get into a game? There are some other forum threads on paizo.com that can help you. I have a question about a boon on the sheet, To avoid spoilers I'll be vague. How long does it last? It isn't specified. More interestingly, in that same boon there appears to be a (-) where there should be a (+). I'm guessing it's a typo and we should go with the real source info?